March was another highly volatile month with numerous days seeing well over 1% swings both up and down. 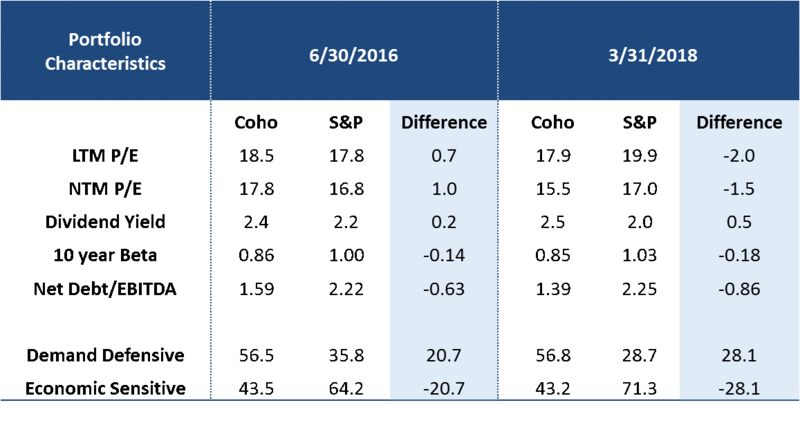 When the dust settled, both Coho and the S&P 500 Index declined about 2.5%, which moved the year-to-date returns into negative territory. This is a fairly large reversal from the strong start to the year that began with a nearly 6% advance in January. We have commented previously that the more economically sensitive sectors have been performing better than some of the more demand defensive sectors. This prolonged period of relative outperformance for cyclicals has made them considerably more expensive than our demand defensive stocks. As a result, we have been reducing our exposure to some of our economically sensitive holdings, which have done particularly well and increased our exposure in existing and new demand defensive positions. Included among these trades are new positions in Altria and ConAgra Brands. With sales solely in the U.S., Altria will meaningfully benefit from the recent tax reform. We believe the company will gain incremental share in the combustible cigarette category, enjoy good growth in moist snuff, and see meaningful upside from reduced risk products. ConAgra is in the midst of repositioning its portfolio away from commodity and private label products with a focus on value over volume. The company’s early success with its frozen food portfolio gives us confidence it can successfully execute on a multi-year growth plan driven by innovation and a shift to higher margin, premium products. It is important to understand that we do not make top-down/macro-driven calls, so these trades and the others we executed this quarter are bottom-up valuation decisions to sell stocks where forward expected returns have lessened and to buy stocks where forward expected returns have increased. We believe these changes make a lot of sense from a long-term perspective. As seen in Table 1 beginning in mid-2016, cyclical stocks, which we call economically sensitive (Consumer Discretionary, Industrials, Information Technology, Financials, Real Estate, Materials, and Non-Integrated Energy sectors), began to outperform defensive stocks by a fairly large margin. Coho Partners has, in turn, gradually increased its weighting to demand defensive holdings (Consumer Staples, Health Care, Integrated Energy, Utilities and Telecommunications sectors) vs. the benchmark by about 7% over this time period, as we have seen better valuations here. This is evident in Table 2. Essentially all of our trading activity in 2018 has favored demand defensive companies at the expense of our economically sensitive holdings. Unfortunately, this repositioning has not yet translated into better returns than the benchmarks, but we believe it will over time. We also firmly believe this repositioning has improved the expected risk/return going forward. The trailing 12-month (LTM) P/E for our portfolio decreased while the P/E for the S&P increased from just under 18x to 20x. The prospective 12-month (NTM) P/E for our portfolio declined from 17.8x to 15.5x, while the prospective P/E for the S&P 500 rose from 16.8x to 17.0x. Our portfolio yield increased slightly to 2.5%, while the dividend yield for the S&P 500 has declined from 2.2% to 2.0%. For more than 17 years, we have witnessed a number of excesses, but we have consistently maintained our value disciplines and investment criteria. There are specific periods in the market cycle when these disciplines cause us to struggle vs. the benchmarks, but over the full course of a market cycle, they have been borne out as providing excess returns with lower risk. Investing is not a sprint, but rather a very long marathon and our objective is to outperform over the longer term by providing strong downside protection during corrections while posting competitive returns during the advancing markets. Finally, we continue to see benefits to our holdings from the recently enacted corporate tax law changes. Perhaps the most direct benefit to shareholders is when the boards take action on the dividend policy. Since we frequently highlight companies that increase their dividend materially, we would add Aflac, Altria, Dollar General and Ross Stores to the list of companies with good quarterly increases. Aflac has given us two increases recently that totaled 21%. Altria has given us two increases over the past three quarters totaling nearly 15% and we fully expect another mid-to-high single-digit increase in this year’s third quarter. Dollar General did its typical increase in March, and it was a 12% boost. Ross Stores, which admittedly is one of our lower yielding companies, bumped its quarterly rate by 41%.